Are you gearing up to ride more in 2017?? Well then… Just in time for the holiday season, we’re offering an amazing deal on our popular Bike Fitting gift certificates with our annual $99 Bike Fit SALE! Gift certificates* are a perfect solution for that hard-to-please cyclist on your list, and for those who already have enough bike gear! This offer is good up until the end of the year on 12/31, so don’t delay- Call us 503-894-9038 or E-Mail us (info@pedalpt.com) to reserve yours today! *Fine print: Limit two (2) per customer. Gift Certificates are good for 1 year from the date of purchase, and can be mailed to you at no extra cost. PS: We’ll see you all for our monthly FREE COFFEE for Bicyclists on Clinton next Tuesday 12/20! A bicycle umbrella (like this one we tested last year) isn’t necessary, but the great tips below are required reading. Note: This post was submitted by BikePortland Subscriber Kevin Schmidt from Pedal PT. Want to submit posts on behalf of yourself or your business? Become a subscriber today! With the onset of the rain this week, it’s always good to review some ‘best practice’ tips for dealing with the weather, while still enjoying your ride. Free Coffee for Cyclists- This Tuesday! Ah September. As the fall months slowly start getting cooler, wetter, and darker in the mornings, you can always count on your friends at Pedal PT for monthly FREE COFFEE FOR BICYCLISTS to keep you warm (and caffienated) on the morning bike commute- Thanks for being part of the bicycling community! When: Tuesday – September 20th- from 7 to 9am. 3rd Annual Tour de France Bike Fitting SALE at Pedal PT! Wow- This has been an *amazing* year for the Tour De France! No matter if you’re a die-hard TdF fan, or have never watched it before . . . EVERYONE benefits during our 3rd Annual Tour De France SALE where we’re taking 20% OFF all Bike Fitting visits! * Offer valid until the last stage of the Tour on 7/24, so don’t delay! * This offer applies to all levels of bike fitting. * To schedule, call us at 503-894-9038, or E-mail us today (info@pedalpt.com) and mention the Tour De France offer! Come join the Pedal PT crew tomorrow (Tuesday) morning for our Monthly FREE COFFEE for Bicyclists Event! What: Free Coffee for Bicyclists, pedestrians and passers by with Pedal PT. Coffee From K&F Roasters, our neighbor on the corner of SE 26th and Clinton. Why: At Pedal PT, we’ve been doing these monthly Free Coffee events for bike commuters now for over 3 years, and our office looks forwards to it every month, as a fun way to give back to the cycling community that gives us so much back! So plan leave a little early tomorrow for the morning commute down Clinton – – – We’ll see you then! Bicyclists on Clinton: Get your FREE COFFEE tomorrow on your morning commute! Great news! The Pedal PT crew will be out on the corner of SE 25th and Clinton tomorrow (Wednesday 1/13) for our monthly installment of “Free Coffee for Bicyclists” from 7am until 9:30am, featuring coffee from our awesome Clinton neighbors, K&F Coffee Roasters. Come join us as we sip coffee, talk bikes, the pros/cons of the new Clinton diverters, and much more- Hope to see you then! Just an FYI: Our annual end-of-year $99 Bike Fitting special is coming to an end next week on 12/31 for any and all bikes + skill levels. This killer price also good for Gift Certificates! My Bike Recovery Story: Return of the Viva! On Wednesday, 11/10 at 12noon, I got a phone call I never thought I’d be receiving. My precious Viva Kilo, which was stolen in July of 2014 had been found, and the very bike that started everything over here at Pedal PT was finally coming home. Elated, I retuned the gentleman’s call, and spoke to ‘Wes’ about the circumstances and how he came to acquire the bike. From our conversation, it sounds like he had purchased my bike from a neighborhood riffraff kid named “June-Bug” for $80 over a year ago, acknowledging that he new the bike was likely stolen. My bike then assumedly sat idle for a year at his place off of 82nd Ave and Clatsop. 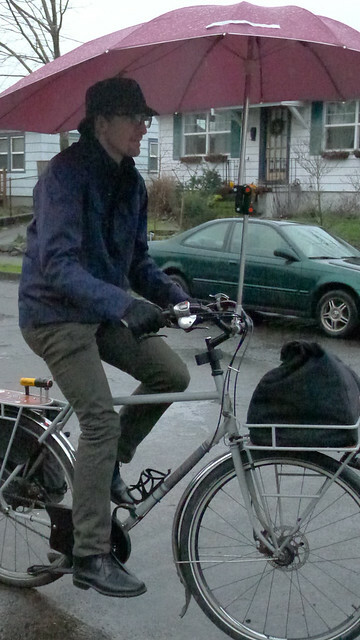 Wes said he recently had some work done on another bike over at BackPedal CycleWorks on SE 72nd and Harold, and spoke to Dave about the Viva, and it’s likelihood of being stolen. Dave looked for it on BikeIndex.com, found my post from July 2014, and got Wes my phone # to call me with the great news. I called Dave, just to be sure, who confirmed Wes’ story. Later that evening, I drove to meet Wes at his place, the adrenaline pumping in anticipation. When I arrived, there was no mistaking that this was indeed my bike. The Viva Kilo had been stripped of saddle (Brooks B67s) and seat post, and the headlight/rear reflector had also been removed. Some mild rust spots on wheels/spokes. A random old saddle, and a jerry-rigged seat clamp had been installed (see pic). However, to my surprise, the roller brakes and NEXUS internal geared hub all were in absolutely perfect working order, and the custom fenders and front/back racks, brass bell, and leather handgrips were also left unaltered. No (new) dents, dings or scratches. Wow. I lovingly brought the bike home in my car, and unfortunately had to immediately get to PDX to catch a plane to Orlando for a conference. Yesterday, I finally got a chance to take it all in, clean and polish her up, tighten bolts, and get her closer to getting back to it’s ‘pre-stolen’ status. I seriously can’t believe my Viva is back home! With that said, I am SO eternally grateful and thankful to everyone who made this recovery possible. My situation is likely not too extreme, but it took some very heads-up thinking from Dave, and of course without Bryan and the BikeIndex.org site, my bike would have likely never been returned. So, my advice: To ANYONE who values their bike, no matter if it’s worth $50 or $5K, take the time now to register your bike on BikeIndex.org. It’s 100% free, it takes less than 5minutes, and IT WORKS! Take it from me, getting your stolen bike back is possible, and I’m living proof that the bikeindex.org system works!